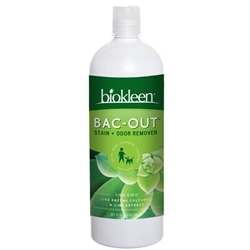 Bac-Out Stain and Odor Eliminator with Live Enzyme Cultures 32 oz. It seems everyone has a Bac-Out story. Bac-Out’s live enzyme-producing cultures attack pet, food, and beverage stains, organic waste, and odor until they are gone, digesting them back to nature, safely and naturally. Bac-Out is safe to use around children and pets, even birds. Bac-Out is a highly effective product to be used for: Bathrooms, Diaper Pails, Drains, Garbage Disposals, Garbage Cans, Cleans and Removes Mold and Mildew Stains and Odors.